This month's Europe at a glance, a collection of visual thoughts on Europe and where it is heading - if anywhere. "BEST COUNTRY TO BE BORN IN 2013 = SWITZERLAND"
...according to the The Economist Intelligence Unit ranking system. The highest number of asylum seekers in Switzerland (according to the Neue Zürcher Zeitung of January the 12th, 2013, do come from Eritrea (a country that does not rank within the first 80 countries in the world in order of living standards), Nigeria (ranks 80), Tunisia (ranks 59), Serbia (ranks 54), Afghanistan (does not rank in the first 80), Syria (ranks 73) and Macedonia (does not rank in the first 80). There were 28.600 asylum seekers in Switzerland in the year 2012. There has always been an often invisible dividing line between human rights and economic reasons for migration, like with the colours of the rainbow. More prosperity elsewhere, means less migration here. Sometimes the position of countries in our global communicative vessel system changes from receiving to sending. This has happened so often in a past nobody wants to remember. How many thousands of people from the Netherlands emigrated right after World War II to Australia, Canada and the United States? Let alone to call to mind the colonial and neo-colonial migration movements many of the European countries have been taken part in. WORST COUNTRY TO BE BORN IN 2013. 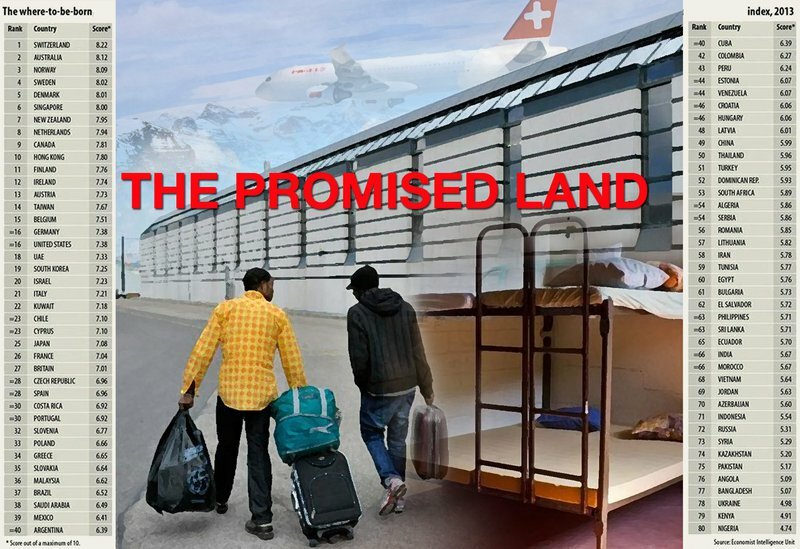 To make the inhabitants of the high up countries in the Best Country List realise why they have become THE PROMISED LAND.